A diabetic foot ulcer—or a chronic wound on the foot—is very common when you have diabetes. You may wonder why that is. For those who have diabetes, nerve function, blood flow and skin health is often compromised. 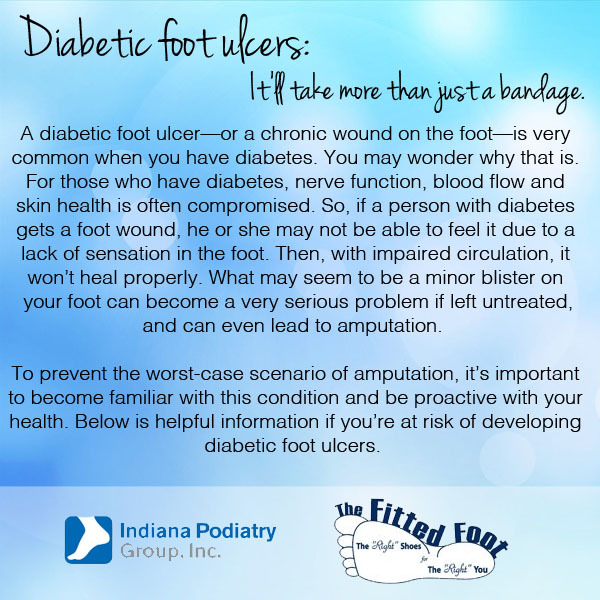 So, if a person with diabetes gets a foot wound, he or she may not be able to feel it due to a lack of sensation in the foot. Then, with impaired circulation, it won’t heal properly. What may seem to be a minor blister on your foot can become a very serious problem if left untreated—and can even lead to amputation. To prevent the worst-case scenario of amputation, it’s important to become familiar with this condition and be proactive with your health. Below is helpful information if you’re at risk of developing diabetic foot ulcers.